Ovex Suspension (Banana Flavour Family Pack) is a treatment for threadworm that contains the active ingredient Mebendazole. This active ingredient belongs to a group of medicines called anthelmintics. Anthelmintics are used to treat certain types of worm infection in the gut. It works by inhibiting the worm’s ability to the absorb sugars that are essential to their survival. This depletes the worm’s energy reserves, which ultimately leads to their death, which usually takes a few days. The dead worms are then naturally excreted from the gut in the stools. A single dose of Ovex Suspension is enough to effectively treat a threadworm infection. However, it may not destroy their eggs. This means a second dose may be required after two weeks should the infection recur. Since threadworms are so easily spread, it is recommended that the whole family are treated at the same time. Ovex Suspension contains sucrose, which may make it unsuitable for those who suffer from fructose intolerance, glucose-galactose malabsorption or sucrase-isomaltase insufficiency. Treating the entire family and instilling a strict handwashing regime is crucial for helping to stop the spread of threadworms. Anyone who is infected should cut their fingernails short to prevent the threadworm eggs from sticking under the nails. Ovex family pack tablets are an effective treatment that can be used to specifically target threadworms in your body’s gut. 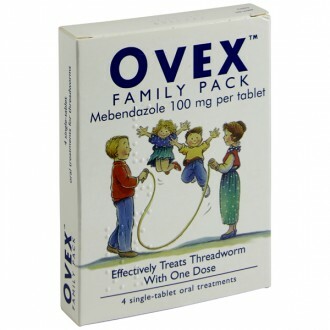 Ovex tablets can be used by both adults and children as a proven treatment for threadworm. For best results, we recommend that all family members should use the treatment at the same time, even if they are not infected. Ovex tablets contain an active ingredient known as mebendazole, which is known to stop worm infections of the gut. It works by cutting off their food supply and limiting their activity, hugely decreasing their survivability. By cutting off this major food source, worms lose their energy, causing them to die off in a matter of days. Once the worms have been killed they will be passed normally in your stools. We know that threadworms can be a real problem, especially in a close family situation where they can spread and eventually infect all family members. This is why Ovex Family Pack contains four tablets in each pack. We advise that all family members take the tablets, even if only one family member is infected with threadworm. One dose is enough to effectively treat a threadworm infection, however a second dose could be necessary if the infection resurfaces after a couple of weeks. Because of the ease at which threadworms spread, the whole family should be treated together. Once Ovex has been consumed it will get to work immediately. It should be understood, however, that Ovex may not destroy all of the eggs laid by the threadworm, and this can cause reinfection later on. This is why it is important to treat everyone in the family at the same time. Always wash your hands before eating and after using the bathroom, shower every day, and wash clothes regularly as this will help to remove eggs and stop them from spreading. When infected with threadworms, the rectal area can become itchy. This can be a particular problem among children. You should avoid scratching these areas at all costs as this will allow the eggs to get under your fingernails and ultimately spread to other people. Tablets: Chew or swallow 1 Ovex tablet. Suspension: Take one 5ml dose. Do not take the tablets and suspension. The dose can be repeated after 14 days if required. Diarrhoea, abdominal discomfort and flatulence. The active ingredient contained in Ovex tablets is Mebendazole. Microcrystalline cellulose, sodium starch glycolate, sodium saccharin, sodium lauryl sulphate, orange flavour and orange yellow S (E110). Sucrose, Microcrystalline cellulose and carmellose sodium, Methylcellulose 15 mPa.s, Methylparahydroxybenzoate (E218), Propylparahydroxybenzoate (E216), Sodium laurilsulfate, Banana flavour, Citric Acid Monohydrate, Purified Water. A single dose of Ovex tablets will kill threadworms but may not eradicate their eggs, which usually causes re-infection and also infection to other individuals. Treating all family members at the same time (except children under two years, expectant or breast feeding mothers) is strongly recommended in order to prevent re-infection. Consult your doctor if symptoms do not improve. If a re-infection occurs, take a second dose after 2 weeks. Keep Ovex out of reach and out sight of children. Need to know more about Threadworms? My child is itching but I cannot see any worms, is it possible they’re infected? It is still possible that your child has threadworms. Sometimes they aren’t always visible, but a consistent itch around the bottom is a top sign of an infection. The itch itself is caused by a mucus that the threadworms discharge. How long after starting treatment should it take for the threadworms to disappear? Ovex Suspension contains mebendazole, which acts to starve the threadworms from the sugars that keep them alive. It will usually take a few days for the threadworms to die off. Immediate elimination is not possible so the symptoms may continue for a few days after taking the treatment. My child is really itchy when they try to sleep, can I prevent this in any way? The only thing you can do to prevent the spread of eggs during the night is to get the child to wear cotton gloves while they sleep. These gloves should be washed daily to prevent the eggs from spreading. One of my children has threadworms and the other is only a 1 year old, how can they both be treated? To ensure the entire household gets treated you will need to see your GP, who can assess and prescribe treatment for the child of 1 year. Children under 2 will require different treatment and medicines like Ovex will be unsuitable. The rest of the household can be treated using Ovex. How has my child caught threadworms? Younger children often aren’t aware about the importance of good hygiene. This can result in them forgetting to wash their hands. Poor hygiene is a main cause of the spread of threadworms. Their eggs can be caught from contaminated surfaces, which have been touched by an infected child. This could include; school tables, toys and holding hands whilst playing. Should my child go to school if they are infected? The Health Protection Agency suggests that infected children should still go to school. Schools and nurseries will have advice to follow regarding good hygiene, so you should let them know to ensure these measures are more vigilantly adhered to. How do I take Ovex Suspension? Adults and children over the age of 2 years; one 5ml spoonful should be taken as a single dose. Ovex can be taken either with or after food. This product should be shaken well before use. How do I take Ovex tablets? Anyone over the age of two years old should take one Ovex tablet, either with food or without, in order to treat the threadworm. The tablets can either be swallowed with water or chewed. For use on younger children they can also be crushed for ease. If using Ovex suspension then a small 5ml spoonful will act as a single dose. Shake well before using. Second dosages should only be taken two weeks later if the threadworm resurfaces. So what exactly are threadworms? Threadworms, also known as Enterobius vermicularis, are a kind of parasitic worm that live and breed in the bowel of humans and some monkeys. The worms will grow to approximately half an inch long and look like small threads of cotton – which is where they get their name from. Threadworms are quite common, and children are more likely to become infected. Some estimates have said that up to 40% of young children (under ten years old) will be infected with thread worm at some point. A child becoming afflicted with threadworm is usually the catalyst that helps the parasite spread to the rest of the family. My child keeps scratching their rectal area, could they be infected with threadworm? At what age can a child take Ovex? Ovex can be taken by anybody over two years old. For younger children you might want to crush the tablets up for easier use. My child is infected with threadworm but is under 2 years old, what should I do? Because of the high chance that threadworms will be spread throughout the family, it is important to treat your children under 2 years old as well. To do this you should visit your doctor as special treatment will need to be administered.